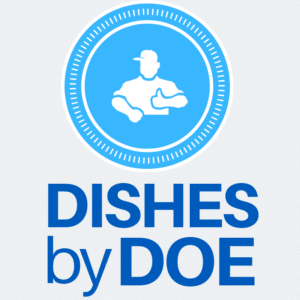 We are pleased to invite you to Dishes by Doe, an inspiring tasting showcase of the culinary achievements of the Men in Blue of Ready, Willing & Able. This year’s event will take place on Thursday, June 6th from 6:30-8:30 p.m at Viacom’s White Box, 1515 Broadway in Manhattan. 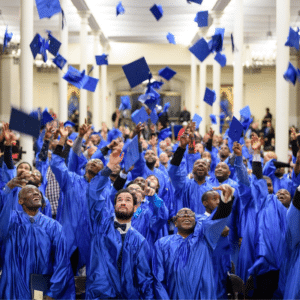 Join us on March 28th at 6:00 p.m. at the Church of St. Ignatius Loyola, Wallace Hall, in New York, NY, to celebrate the life-changing achievements of the Men in Blue of Ready, Willing & Able. Light refreshments will be served. For more information and to RSVP, please contact Stephen Diefenderfer, Director of Special Events, at 646-672-4225 or events@doe.org. 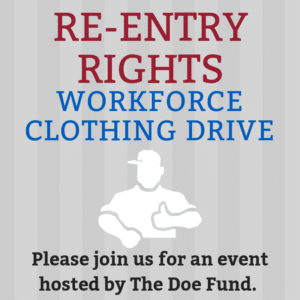 The Doe Fund is seeking clean and gently used men’s clothing donations to help outfit formerly-incarcerated and homeless men with workforce-appropriate apparel. If you have men’s clothing items in like-new condition that you’d like to donate, find a location near you. We are accepting: khaki pants, jeans, work boots, polo shirts, button down shirts, belts, winter coats, and more. 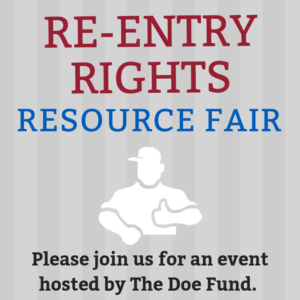 Join us on January 28th from 6:00 to 8:00 p.m. at The Doe Fund’s Peter Jay Sharp Center for Opportunity in Brooklyn, NY, to take advantage of the many re-entry resources available to you. At this special event, we will be offering: voter registration, a legal clinic for certificates of relief and good conduct, and free legal consultation.